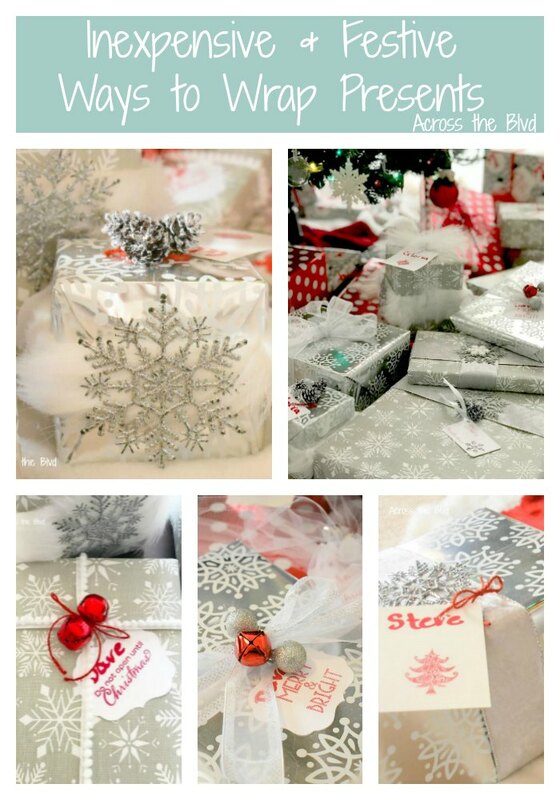 Need ideas for inexpensive and festive ways to wrap presents? 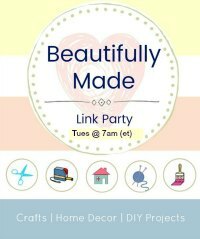 I’m sharing some ideas today that are budget friendly, fun, and pretty! I love wrapping gifts using pretty ribbons and embellishments. 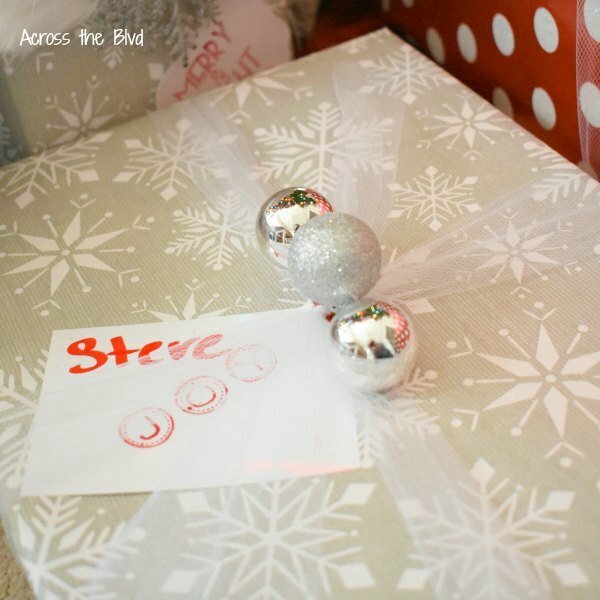 Using inexpensive items from the dollar store to dress up the packages is a great way to get a lovely look. The first thing I do in mid November is to set up a gift wrapping station. 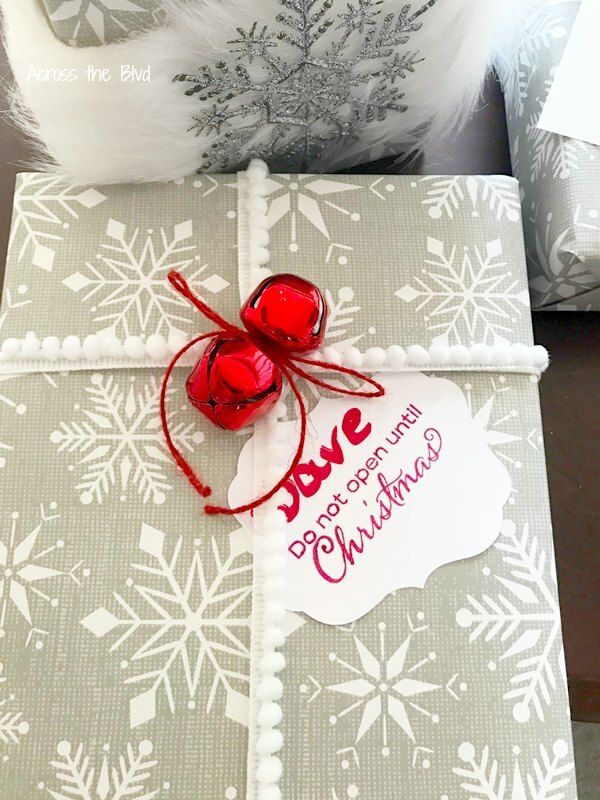 I use one of our guest bedrooms for this and this room becomes the spot that I store the gifts until they’re ready to be wrapped and placed under the tree. 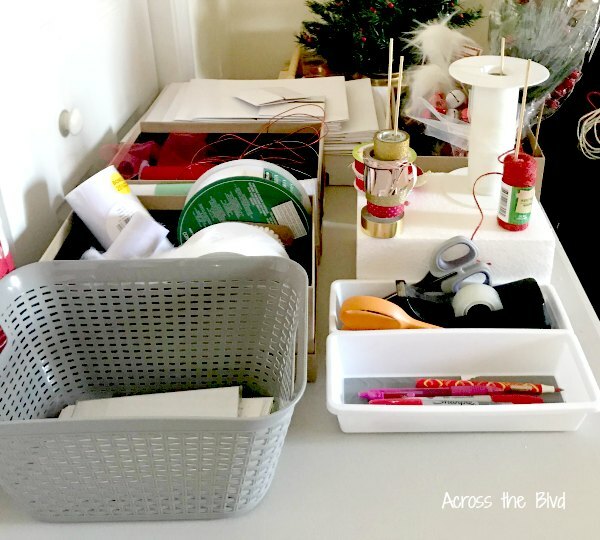 I set up a folding table and use small bins, trays and boxes to hold wrapping supplies. If I make sure to place things like the tape and scissors back into their tray, I don’t have to hunt them down when I’m ready to do more wrapping. That alone is a time saver for me! Using a block of foam and wooden dowels to hold spools of ribbon keeps the ribbon handy. I set the table close enough to the wall so that I could store the wrapping paper rolls between the table and wall. By the time Christmas morning gets here and guests add their presents, we have a large pile of gifts under the tree. 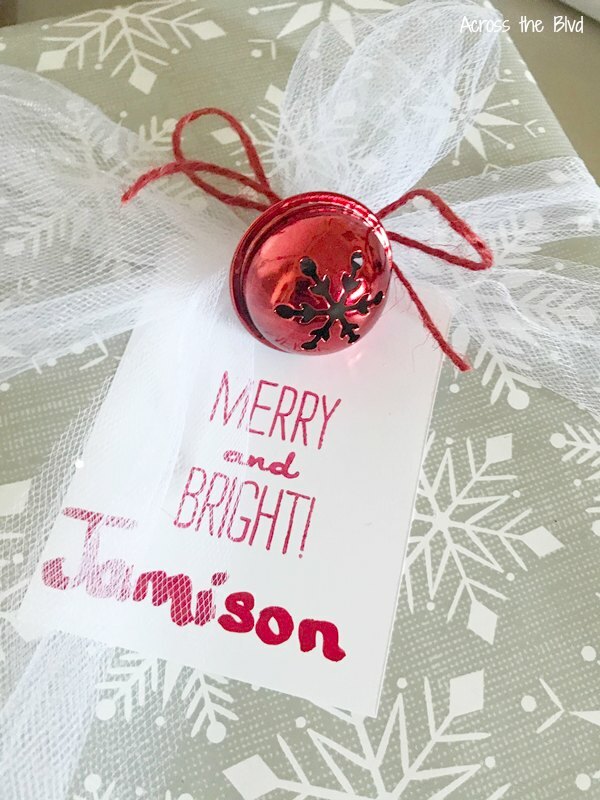 To make it easier to spot the name tag on the gift, I made my own over sized tags this year. Some are made on Cricut Sticker Paper and others are plain card stock. 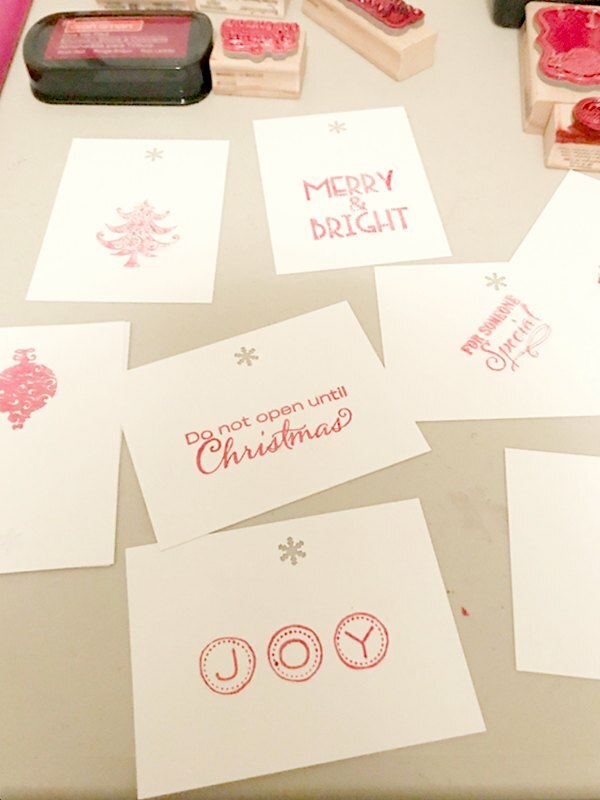 I used an assortment of Christmas Stampers for the tags and a red marker to write the names. I have a small snow flake hole puncher that I used to make holes to hold string or ribbon for tying the tags to bows on gifts. I haven’t bought a package of bows in years. Instead, I use ribbon to tie simple bows on gifts. One of my favorite things to use is white and red tulle that I buy at the Dollar Tree. These are 8 yard spools, so that’s a lot of ribbon for very little money. I added a couple of bells that I also bought at the Dollar Tree to the bow using Dollar Tree red twine. Using two main colors for gift wrapping is something I’ve also been doing for years. 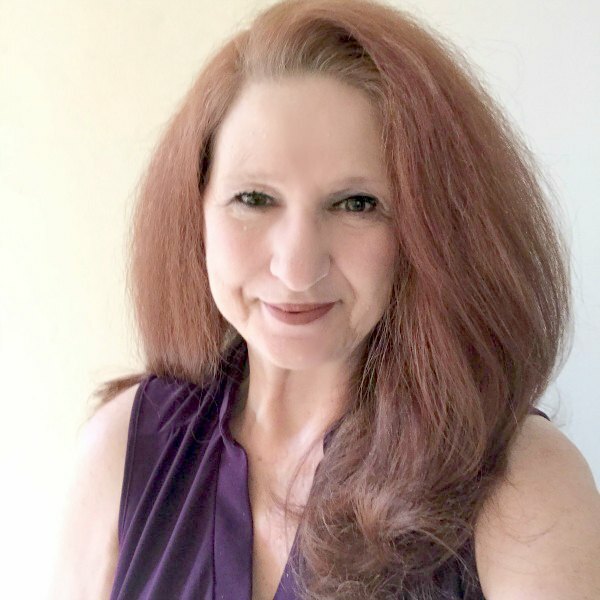 This year, it’s red and silver, with whites and grays added in. I always hit the after Christmas sales for wrapping paper. It’s amazing how deeply stores will discount it. I stock up each year. Another way to add a fun embellishment is to use inexpensive ornaments. These silver snowflakes come in a package of 24 from Walmart. I tied some of them onto the bows and others I added a small dot of glue to hold them in place. Using mini frosted pine cones is a pretty look, too. I added a strip of faux fur from my craft stash around the side of the box and glued a snow flake to it. The mini pine cones are glued to the top along with a gift tag. This soft white ribbon along with red bells makes a pretty presentation. The sticker tag is one that I cut using my Cricut. Small ball ornaments that I bought at the Dollar Tree are pretty when clustered together. These are glued to the tulle. 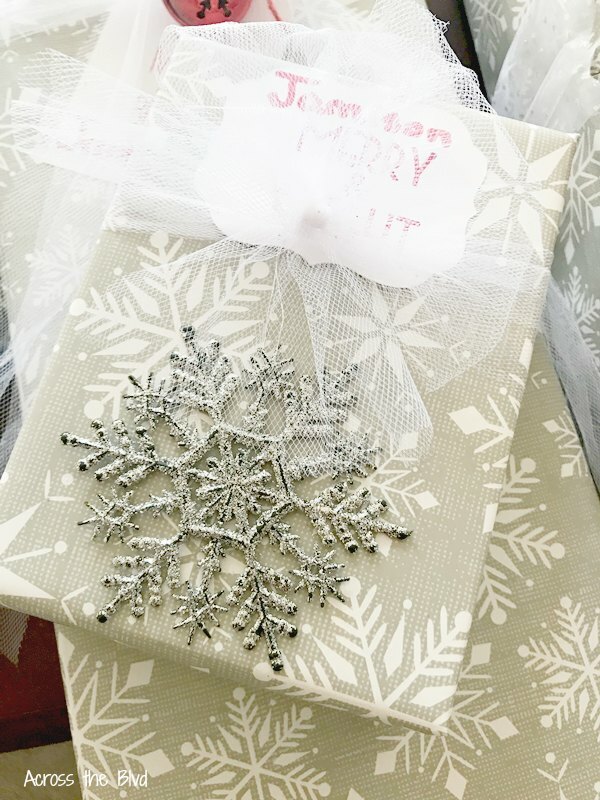 Embellishing gift wrapping to make each package unique is a fun way to dress them up. 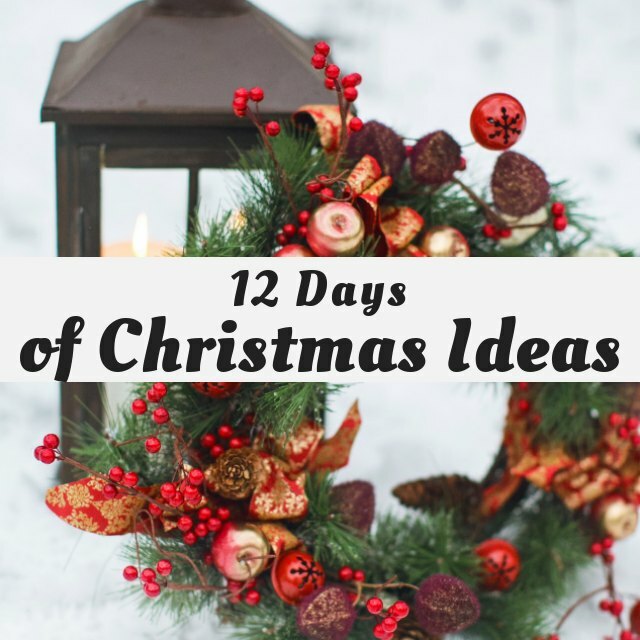 Buying items to use for the embellishments from dollar stores is a great way to get a fun, festive look for less. I love the coordinated look of the silver and red underneath the tree. 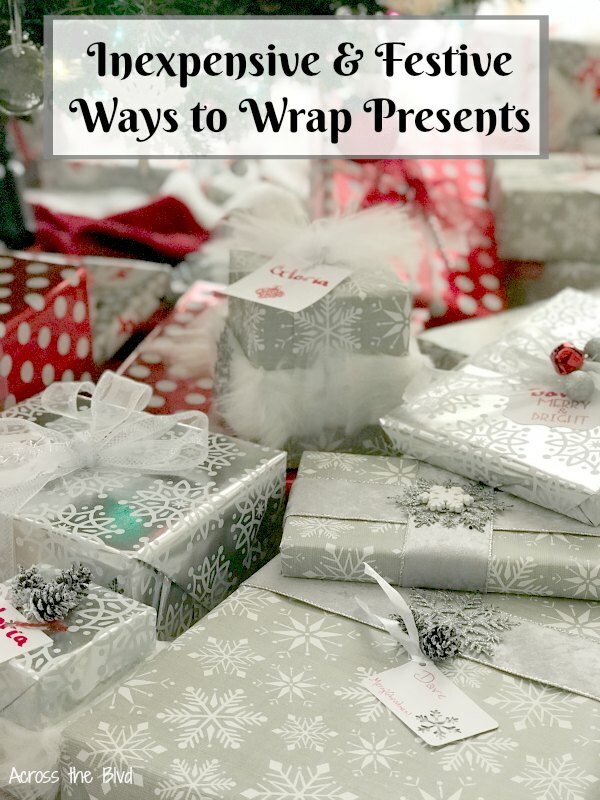 I’d love to read about your tips for inexpensive and fun wrapping ideas! Your gifts are so elegant and pretty, Beverly. I LOVE LOVE LOVE your gift wrapping station idea, especially the wooden dowel to hold ribbon and the trays for the tape & scissors. I definitely need to do this next year! 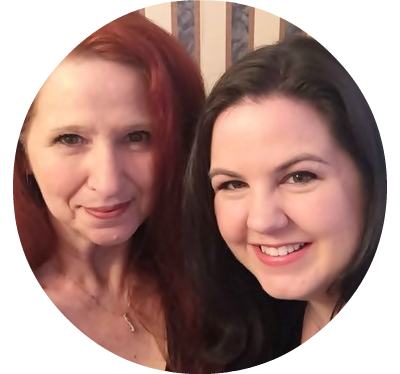 Your gifts are gorgeous!!!! I would be excited receiving any one of these parcels. To me presentation means lots, it shows care and love. Such nice gifts. You are so organize with your gift wrapping station, Beverly! I love it! 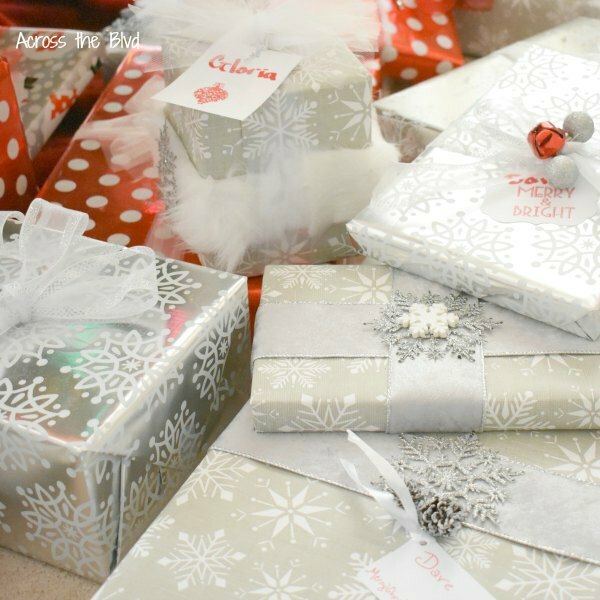 You offer quite a number of great tips and ideals on how to make your wrappings look beautiful and pretty! And that’s really useful to all of us this time of year! 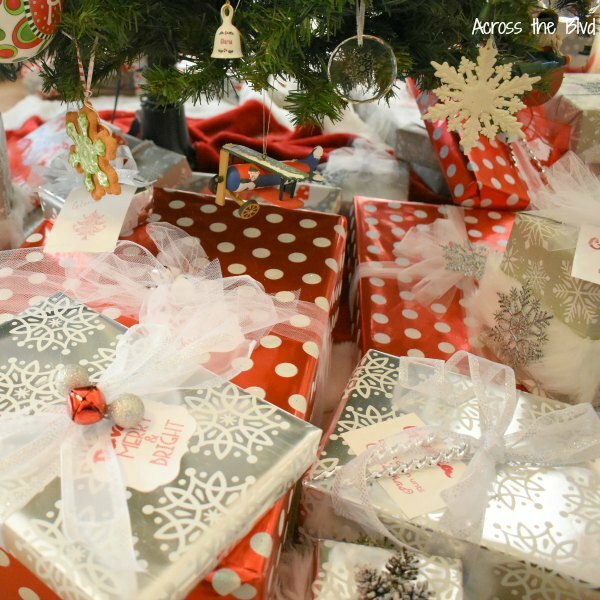 Your gift wrap station is genius. Definitely need to start setting one of those up every season. Thanks for the fantastic idea! All your gifts are so beautifully wrapped! I love the silver. And I also love how you’ve embellished them. 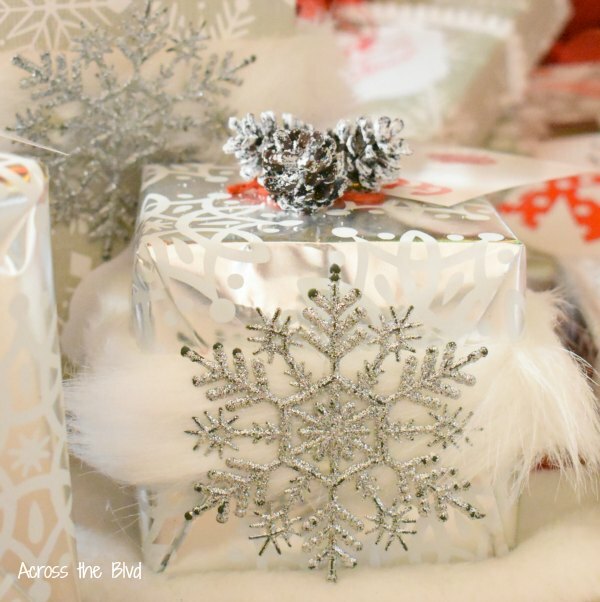 Your silver gift wrap is gorgeous and i love all the pretty embellishments. 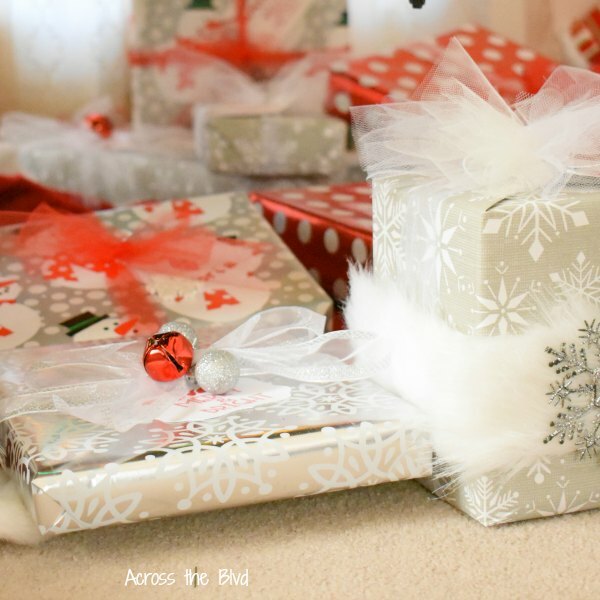 I love the idea of a wrapping station. I usually sit on the floor and it’s a mess. Your gifts are beautiful! And Dollar Tree is my favorite place to shop!